April is when there are mysterious happenings that are “vernal,” meaning “of the spring.” One of these happenings involves strange activity in the “vernal pools” hidden in our wooded lowlands. These pools, most of which go dry by summer, are places where certain amphibians and crustaceans must breed and grow to fulfill their important roles as foods for other wildlife and sources of wonder and discovery for us. 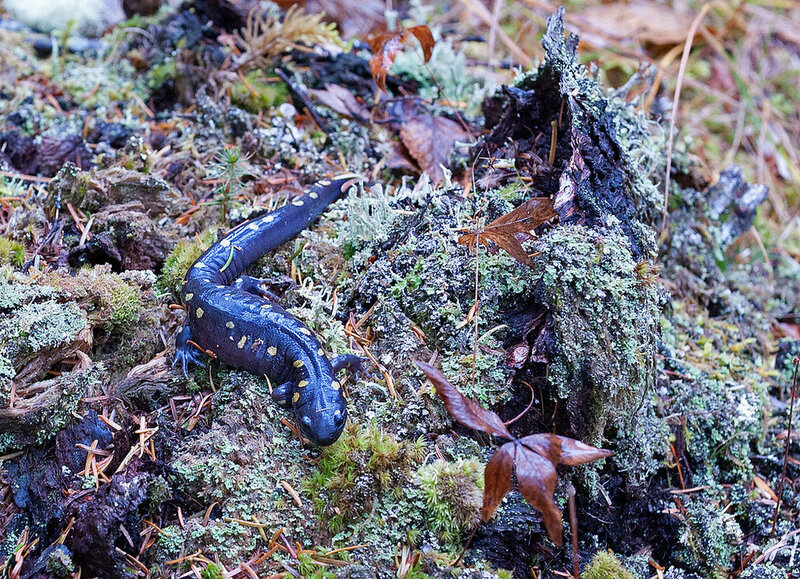 Maine vernal pools are an indispensable part of the life stages for at least three native amphibians: the Wood Frog, the Spotted Salamander (shown here), and the Blue-Spotted Salamander. The pools also are just about the only place where native fresh water crustaceans called Fairy Shrimp swim, which they do by backstroking upside down. Some of the amphibious vernal pool creatures, including the Spotted Salamander, are “pool-specific” creatures. That is, when the temperature gives them the signal that it’s time to mate and lay eggs, thousands of them embark on a nocturnal march to return to the pool in which they were born. On such “Big Nights,” these tiny travelers often must scurry relatively long distances and cross roads to get to their family pool. Nature lovers with flashlights often try to give them a hand. But, of course, more profound protection is needed for their homeland destinations. The problem with March here is that you can’t trust her. Her primary jobs are to bring us Spring and Daylight Savings Time, but she usually falls in love with Old Man Winter and carries on with him in the most distracting ways. We had a big snowstorm last week, but not as bad as the white-out blizzard that you see in the accompanying image. That occurred on March 14, 2018 – exactly one year ago today. We’ll likely get more snow before April dances in, and maybe some after she gets here. Technically, March is supposed to bring us two Springs. March 1 is “Meteorological Spring,” which is based on the annual temperature cycle and our division of the year into the four-seasons of Spring, Summer, Fall, and Winter. Of course, such reverence is not reserved for poets and essayists. Nor is it really an attempt to find solitude in the literal sense, nor necessarily a search for peacefulness. It seems that some of us need to escape humanity at times and be absorbed into a place full of different life – furry, feathery, leafy, and other – where we can see, feel, and think differently. Some of us also seek – just sometimes – a place where we can experience a mixture of wonder and mild fear that makes our life briefly seem fuller. The local Yellow Trail is one place to go alone in winter to experience that anxious wonderment. It’s rough and icy and dark and even dangerous in spots for those who are not careful. But it’s where you can disappear into a quiet, non-human dimension. It’s mid-winter, when most of our coastal water lobster boats have brought in their traps and are taking vacations “on the hard.” But not all of them. Some lobster boats undergo a maritime metamorphosis: they develop wings in the form of masts and booms and become scallop boats that fish in the cold. Most of these winter fishing vessels trawl with scallop dredges, which are ingenious metal and twine mesh contraptions. They scrape the bottom for scallops, but have escape routes for fish and openings for removal of the mollusks by the fishermen (including women). Scallop fishing has been highly regulated in Maine waters since the mollusks got to nearly-endangered levels in the mid-2000s. The season is scheduled for 50, 60, or 70 days, depending on zone. Those fishing days are spread over a few days each month from December into April, with some additional November dates available for diving. Lately, we’re hearing a lot of The Twelve Days of Christmas. That’s the carol in which the singer’s True Love gives the singer gifts on each of the 12 days. Unfortunately, most of those gifts aren’t right for a Maine Christmas. A major problem is that True Love apparently doesn’t know much about birds, yet half of the gifts are birds. Take True Love’s favorite gift, “A Partridge in a Pear Tree.” No self-respecting, seed-eating ground bird is going to stay in a fruit tree unless it’s nailed there. “An Eagle in a Pine Tree” would be a better first gift for us. Next, the only sensible gift is delivered: “Five Gold Rings” (which we wouldn’t mind getting). But then, after this one day of sanity, True Love’s odd romantic impulses revert to birds: “Six Geese A-Laying” are sent. Delivering geese while they’re a-laying is bound to result in a mess on the porch, if not injury to the UPS man. “Six Geese Migrating” would be a little better and have the benefit of gifting a vision of free-range birds. Next, we have an unlikely winter delivery of summer birds: “Seven Swans A-Swimming.” For Christmas paddling gifts here, we need birds that can survive out beyond the ice; “Seven Loons A-Swimming” should do the trick. These feathered offerings are just the warmup for True Love’s big, loud finish with performance gifts. There are deliveries of “Eight Maids A-Milking,” “Nine Ladies Dancing,” “Ten Lords A-Leaping,” “Eleven Pipers Piping,” and “Twelve Drummers Drumming.” With two exceptions, these are (just barely) acceptable for a Maine holiday party. However, we draw the line at maids a-milking and lords a-leaping in the house. We’d allow “Eight Teens Moon-Pieing” and “Ten Men A-Beering,” though. That should patch this old thing up wicked-good. November in rural Maine has become a month for avoiding Turkeys as much as for hunting and eating them. The wild ones roam freely in foraging flocks called “rafts.” It’s not unusual to see a raft of 20 or more Turkeys working a field. They’re fun to see, but the ones that you don’t see – the ones in the brush alongside the road – can be problematic. Many Wild Turkeys are jaywalkers with a death wish. They dart across the road just when vehicles get within skidding distance. Turkey-related vehicle accidents reportedly are increasing here. Thank goodness these birds sleep at night. We’re beginning to wonder whether Maine has been too successful in reintroducing the birds. The original colonizers of New England reported Wild Turkey rafts of more than 100 birds, which the colonists hunted relentlessly. By 1672, it was rare to see a Wild Turkey in Massachusetts. But the birds remained numerous in the sparsely-settled north, now called Maine. As Maine became settled, the number of Wild Turkeys here diminished severely; by the 1880s, the birds were uncommon in much of the State. After several unsuccessful attempts to reintroduce Wild Turkeys into Maine, a small imported flock took hold in the 1970s. That flock has now grown to an estimated 50,000 to 60,000 Turkeys and is continuing to grow, according to Maine wildlife officials. In a recent State survey, more than a third of Mainers responded that additional steps should be taken to reduce the State’s Wild Turkey population. We run at him shouting and waving the broom. He slowly gets on all fours and raises his quilled tail straight into the air – a defensive posture that reminds us not to get close. He turns and walks off in slow, waddling dignity. Perhaps he senses our profound weakness when he sees a broom instead of a rifle. Porcupines can do considerable damage to trees and we’re not aware of any benefit that they confer on the world, except perhaps as a delicacy for large weasels. The State of Maine, a tree-conscious place, seems to be without much sympathy for Porcupines. Under our regulations, Porcupines are considered numerous and may be taken by licensed hunters in any way, at any time, in any number, except on Sundays or someone else’s posted property. Nonetheless, there is the view that Porcupines were here before property rights and are part of a complex natural system that we humans invaded and don’t fully understand. And, there is this: sometimes they’re cute. But, not often. The fog is thick. There’s about 15 feet of visibility as we begin to pick our way along Great Cove’s rocky shore. Above the sound of the lapping tide we hear “Whump- Whump- Whump” – silence – “Whump- Whump- Whump.” We think we know what it is: big wings pushing and pulling heavy air, then gliding. Very near. We wait. It emerges as a silent shadow almost directly over us: its legs and toes are perfectly aligned and its huge wings are extended straight out, a gliding swan dive that defies gravity; its war bonnet plumes are streaming from its prehistoric head; its long beak is a spearhead piercing the fog. Then, its wings move in large, rolling undulations -- “Whump- Whump- Whump.” It disappears in the mull. We’ve glimpsed a Great Blue Heron or the ghost of one. In 2009, Maine wildlife officials initiated a continuing study to help find the causes of the Great Blue’s decline. There apparently have been no definitive results yet, but we have learned from the study that some of our Great Blues take their winter vacations in Florida, Cuba, Haiti, and the Bahamas. Summer is when we often meet new seasonal neighbors, which usually is fun. However, the first meeting with this summer’s most intriguing new neighbor did not go well – he was in the process of destroying our birdfeeder. He’s the biggest Black Bear that we’ve ever had visit us; we guess that he runs well over 400 pounds. Watching a creature that big trying to munch tiny seeds would have been laughable were it not for the fact that he and we were eyeing each other at 40 feet and he had put our birdfeeder seriously out of torque. 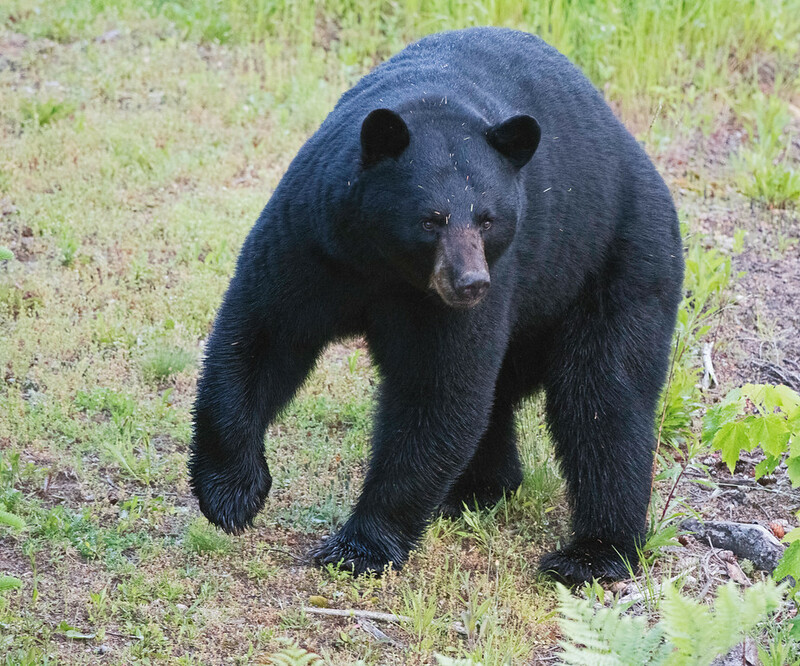 Maine contains more Black Bears than any of the lower 48 states. Black Bears virtually never attack out of aggression or even for protection of cubs, according to State Wildlife officials, Apparently, the few reported dangerous confrontations in the State virtually always relate to very hungry bears, available food, and panic by the bear and/or human.